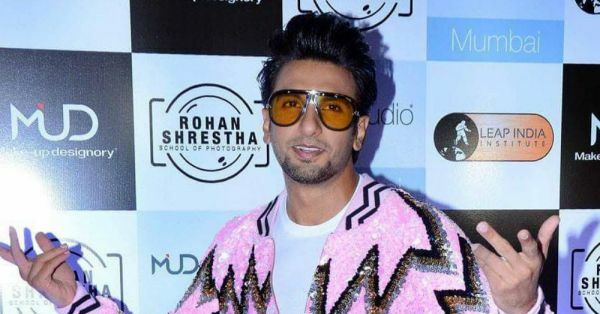 Ranveer Singh Wore A Pink Women’s Jacket & Owned Every Bit Of It! Ranveer Singh’s fashion choices are as colourful and versatile as his resume. Usually, people, especially artists, bend themselves as per the trends and popular styles but Ranveer Singh has crossed that line of limitations. He has literally made the world accept and then appreciate his sense of style and we don’t regret it at all. As an actor, the characters Ranveer has played were masculine and intense but his style is all-things-feminine and eclectic. It’s safe to say that he’s certainly a man in suit but he’s the man in ‘floral’ suit. He loves prints, tinted aviators and striking, avant-garde statement silhouettes. And this Wednesday night, at an event in Mumbai, the Padmaavat star continued to impress everyone with his specific sartorial flair. It’s impossible to miss it when a man, especially, Ranveer arrives wearing a dramatic baby pink, gold and black sequined bomber jacket in the world that labels pink as a feminine colour. But that’s not all, not only was he wearing a feminine shade like a boss but his jacket was from designer Manish Arora’s spring 2018 RTW women’s collection. He paired it with a white tee, with matching skinny pants and silver sneakers. He finished his look with a pair of yellow tinted aviators. A post shared by manish arora (@manisharorafashion) on Aug 20, 2017 at 7:27am PDT He has walked the ramp for Manish Arora in a multi-coloured sequin jacket during the Lakmé Fashion Week in 2017. It’s not a surprise that Ranveer chose an unexpected outfit, but every pick of his is so different that it leaves us curious about what we might see next. Honestly, his looks are sometimes more in news than any leading lady of Bollywood. Since the beginning of his career, he has balanced a grunge look with bright pops of colour. He has a fresh perspective on everything and it certainly makes Ranveer a full package, considering he’s a great actor, amazing human being and not to forget, a good boyfriend. Hopefully, sometime soon, we’ll see more actors experimenting with the looks and it would no more be ‘odd’ for men to don florals, sequins and colourful attires. Until then, let’s keep appreciating Ranveer Singh!